Dr. Young is a licensed Physical Therapist. She earned her Doctorate in Physical Therapy from the University of St. Augustine for Health Science in 2009. 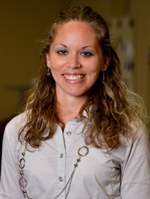 She specializes in the treatment of orthopaedics, women’s health issues, balance and gait disorders. She enjoys running and spending time with her four dogs.